Garlic plants are one of the more heralded vegetables in the home garden. Plant cloves in the fall, and you will harvest garlic bulbs in late spring to early summer. Did you miss the fall planting? That's okay. Plant some bulbs, as early in the spring as the garden can be worked. Home grown, freshly harvested bulbs, are much stronger than those found in stores. It can be cooked and eaten by itself as a delicious food. Garlic is simple and easy to grow. Anybody, make that everybody, can learn how to grow garlic plants. Plant it in just about any slightly rich soil, in a partly to mostly sunny location and it will thrive. Best of all, it takes little space. It can even be grown amidst your flower garden, if you are short on space. Garlic is most commonly used as a spice or herb. The robust flavor of garlic, lends to its use in countless recipes around the world. Perhaps it is best known for it's use in Italian, Chinese, and Oriental cooking. It's roots can be traced to Central Asia. Garlic does not stake it's claim to fame on cooking alone. It is also widely used in organic gardening. It's strong odor is a natural repellent to many insect pests. In addition, garlic was believed to have the power to ward off demons and vampires. Since ancient times, Garlic has been hailed for it's medicinal value. It was used to treat a wide variety of ails. Current research shows that it aids in lowering cholesterol, reducing cardiovascular disease, and even cancer prevention. Some studies suggest it helps to relieve cold and flu symptoms. Did you know? We all have fears. As a matter of fact, there are so many phobias, that psychologists can hardly keep track of them all. Just so you are well informed, Alliumphobia is the fear of garlic. 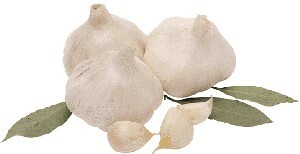 Regular Garlic: White or purple varieties, sometimes called softneck. Elephant Garlic: Slightly milder in taste, with a much larger bulb. One clove can be 2 1/2" - 3" long. Elephant garlic is not only good for spicing up food, but can be cooked by itself. Cooked or grilled, it takes on a very mild taste. Eat it by itself, or spread it on a piece of Italian bread. The "root" forms a bulb, comprising several segments, called cloves. Separate the cloves, and plant them in the fall for a spring crop. Space cloves 4" to 6" apart, in rows 8" to 10" apart. They will begin to grow and take root until snow covers the ground. It is okay, if the plants grow a few inches above the ground, prior to the onset of winter weather. In the spring they will start growing again, and will be harvestable in late spring to early summer. If you missed planting garlic in the Fall, plant them in the spring, as soon as the ground can be worked. You will still get a good crop, just not as big, or as early, as those planted in the fall. Add a general purpose fertilizer, in the fall, and once a month during the growing season. Keep the soil moist. Garlic plants will not tell you when they are thirsty. Make sure to water regularly, especially as dry weather arrives. The plants are resistant to most pests. It's odor wards off many insects. On occasion, root maggots can be a problem, attacking the bulbs. Tip: Try planting garlic near your roses, to ward off aphids and Japanese Beetles. Garlic plants are resistant to most forms of disease. You can begin to harvest bulbs for cooking, as soon as a bulb starts to form.. Harvest the entire crop, after the tops have fallen over and dried. Clean the bulbs off, and leave them to dry in the sun for a day or two. Note: Some people say not to rinse them off with water. There is no harm to this, as as the plant is used to being outside in the rain. Just don't leave them in standing in a bucket of water. For long term storage, it is important to cure the bulbs. How to cure garlic bulbs. You can weave the stalks into a braid and hang them for future use. Or, you can cut the stalk off and store them in a cool, dry place. Properly stored, it will keep over the winter months. With a little luck, you will run out, just as the next crop arrives. Garlic is among the hardiest of plants. It is resistant to cold. It goes dormant over the winter like winter wheat or lawns, but does not die. Once spring arrives, it begins to grow with the first warm days of late winter or early spring. It is not harmed by frost, freezes or even snow.